We’re here today with the fantastic, Lorrie Struiff. She’s here to answer a few of our questions. A Heap of Trouble is a western romance/action/mystery/humor, so yes, I’d say it crosses over a few genres. I’m working on a 10k word, each story, of a series titled The COD Club. (Call on the Dead.) It’s a humor series of a woman who can talk to spirits. The first one is available now. None, all come from my imagination. Well, except maybe forWinnie from the COD Club. I think she is my alter ego. Lol. It depends on how much time I have to devote to the book. Usually a full book will take me under a year. A short story, about three months. Do you have a set schedule for writing or do you just go with the flow? I definitely go with the flow of the time I have. I do write every day, but some days I may not be working on my story. I critique for others, research, comment on blogs and promo. Authors will know what I mean. Lol. I’m strictly a pantster. I mull the story over in my head for a week or so then hit the keyboard. Go to dinner with friends, watch TV, read my Kindle books. The story and the characters I’ve created in my head. When I feel I’m onto something “hot,” or something “different,” I can’t wait to hit the keyboard. Most times I think of characters first. I like to take a few unusal characters, throw them together, mix well, and see what sort of trouble I can get them into. In A Heap of Trouble, I threw a western sheriff and a monkey together. And of course a love interest for the handsome sheriff. Oh yes. No matter the tension of the story, we all need a giggle break. It makes your characters human. What are your thoughts on love scenes in romance novels? Do you find them difficult to write? I like romance scenes in novels. In Gypsy Blood I wrote a fairly graphic scene. In Heap of Trouble, I wrote for all ages. So, it depends on the story I’m writing at the time and where the characters lead me. What do you think of critique groups in general? If you find a good one, I think they are the best friends of an author. I take part in two. My home group and Critique Circle online. They have helped me beyond belief. How many books have you written, how many have been published? This is sort of weird. I started with short stories, received many rejections. When my first one was accepted, all that I wrote after the first have been accepted. Lucky, I guess, or I learned how to write better. Hmm. I think it’s probably the later. After you've written your book and it's been published, do you ever buy it and/or read it? Sure, I download it on my Kindle. I may not read it, but it makes me feel like an author. Nelson DeMille and Nora Roberts. I have a wide reading range. Among your own books, have you a favorite book? Favorite hero or heroine? Gypsy Blood is my favorite. Rita Muldova, my Roma police detective, is my favorite heroine. If a reader enjoys the story it gives me great satisfaction. The twists and turns of the plot. If you weren't writing, what would you be doing? I’d hate to find out. Lol. Writing keeps me off the street corners at night. Okay, I’m kidding. I’d probably be reading. Either a sigh of satisfaction or a bunch of giggles. Books of course, food that make your taste buds tingle, and handbags. I have a thing for purses. What is your secret guilty pleasure? Snacking at night while watching TV. I’m bad. Black or red? Neither. I’m a jeans and sweatshirt person. Ocean or mountains? Oh, give me the mountains. A little cabin and a computer. I’d be a happy camper. City life or country life? Country life. I like to see the stars at night. I'm always ready for liver and onions. Yum. You'd never be able to tell, but I’m shy. Beggar chattered and shook his head. Beggar looked up the stairs, back at Cole, then shuffled across the floor like a man going to his own hanging. He eased up on the desk. Cole held back a laugh and fastened the collar. “See, nice and soft.” He stared the critter in the eyes. “And if you wet on me again, I’ll drown you in the creek behind the church. Understand?” He slid his wrist through the rawhide loop. Beggar huffed and crawled up onto Cole’s shoulder. The Smithy had delivered a high-stepping filly hitched to a surrey with a shade top. It was three o’clock and near time to fetch Mattie. Spending the day with that pretty gal put a smile on his face, and his mouth watered at the thought of all the food she’d be packing in the basket. As they passed the hat peg, Beggar snatched the Stetson and rammed it backward onto Cole’s head. Cole plucked off his hat and set it on straight. He walked the filly the short distance to the mercantile. As he helped Mattie into the surrey, the hem of her yellow dress rode up a few inches and he caught another peek at her ankle and at least three inches of her leg. His heart fluttered. “Ah, you look mighty fetching today, Miss Mattie.” And she did in that frilly dress and her hair piled atop her head in them little curls. When she smiled at him, his stomach lurched along with his heart. “Thank you, Cole, and don’t be so formal. Just Mattie will do.” Beggar, tied to the armrest of the backseat, crawled over the front seat and onto her lap. Beggar looked up at Mattie, blinked, then jumped off her lap and into the back. He flopped next to the huge picnic basket. Cole beamed at the compliment and snapped the reins. Once out of town and on the dirt trail, Cole had a hard time keeping his eyes forward. He wanted to count every freckle on her pretty face. The bright sun reflected off the smooth stones along the side of the trail. The steady clip-clop of the horse’s hoofs pounded the dirt and sent small puffs of dust in the air. Mattie’s rose scent tantalized his senses. Every so often, it would waft over to his side, caught on the hint of an intermittent breeze. The carriage springs creaked beneath them and birds warbled in the trees. He sighed and hoped this day with Mattie would be perfect. Lorrie's Bio: Lorrie lives in West Mifflin, PA, thirty minutes from downtown Pittsburgh. She lives at home with her favorite toy—a computer. Once a gold medalist teacher/manager for a big-name ballroom dance studio she has retired and now enjoys the quiet life of writing and watching TV. But she loves to have lunches with local writers to keep abreast of the challenging world of publishing. Lorrie writes in many genres so you never know what she will come out with next. She never wants to bore her readers and enjoys the thrill of entertaining them by writing a good story. She would love to hear from her fans at struiff@msn.com. Please put “reader” in the subject line. Thank you for choosing my book. Awesome interview! I love that you incorporate humor into your books, I find that it's so important to a character's development. Hi Michelle and Debbie, thanks for stopping by. Humor is so subjective as we all know, Michelle, but I try. No Deb, you are not alone in this insanity. I'm with you girl. Love it Lorrie. You are fun to read about. Once again, I have been commenting, but they are not showing up. Help me Lynn. I'm trying annon, this time. I have been trying to post comments back to you ladies. The site is not posting my comments. I'm trying a different browser to see if this works. This is frustrating. Bear with me. Ha, it worked. I'm in like flint. Now, if I can remember the comments I've been trying to post. Hi,Michelle, humor is so subjective, but yes, it's important and I try. Deb, believe me, you are not alone. Hugs back to you Tab's. Yes,Kim. Humor does go a long way. Most times it just sneaks out of me. No control. lol. I'm a character first writer myself. My favorite of your characters is definitely Winnie. We of a certain age can relate to Winnie. I'd love to know her personally. Knowing you, Lorrie, I think I kind of do. Hmm, Marva, did you have a bit of trouble getting on the site, too? Oh yeah, you get to know Winnie, you know me. She is part of me. I do dumb things I call Winnie-isms. Like getting lost in the big mall last week. I hadn't been there for at least 15 years and they had changed so much. To keep it brief, I was ready to sit on the floor and cry because I couldn't find the row with my car. And I was exhausted. An angel of a woman drove me around the whole mall until we found my car. Now that is a true Winnie-ism. A true Winnie-ism and a true angel of a woman, that's for sure, Lorrie. Malls give me the willies. But back to your interview. It's a great one. Beggar and the crew are great but I have to say, I love Rita. And I'm waiting for a sequel on that one. Great interview, Lorrie! I love learning new things about you lol You and I definitely have Nelson DeMille in common! Love his books. 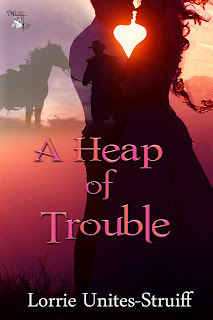 Loved Heap of Trouble, naturally, and can't wait to read more of your books! Love your process of writing. Is that true for all of your stories, say, short stories verse novels? Thanks for the interesting interview. I learned a lot about you and writers in general. I've read this and yes, you have it all in this novella. OMG! I've tried to messedup the code to post my comment like five times already!!!! I hate those things!!!! Holy crap! I need an editor to check my comments! I misspelled like seven words!!! I treid to Preview comment but it wouldn't let me so I just posted. Nice interview ladies. Did I know you were from Prescott, Lorrie? I'm from AZ myself - very rural. Maria, malls will certainly give me the willies now. Count on it. Julie, two DeMille fans, how nice. HI Lo, yes it's true of all my stories, a true pantster here. Darla, you made me laugh. We should have wordcheck on blogs. lol. Oh Margaret, if you read about Winnie, yep, she's me. But hold, it. I really don't speak to the dead, ya know. Penny, I'm not from Prescott, I'm from Pittsburgh, Pa. I've been there and fell in love with the place. I used it on one of my short stories because it fit so nicely. Yes, Gail. Liver and onions, yummy. As you say on my blog today, all writers are crazy. I think I go just a bit further. lol. Wonderful interview, ladies! Lorrie, your wit and wisdom come through in your work. Keeps you off the street corners at night - too funny!